No more DRY, PEELING, CRACKED or BRITTLE nails! 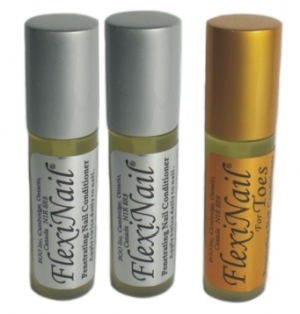 FlexiNail is the answer to your dry, cracking, peeling or brittle nails. It is a penetrating nail conditioner that stimulates healthy looking fingernail growth. FlexiNail is NOT a temporary "hardener" product and does NOT involve applying fake nails. It will dramatically improve your nails and keep them that way or your money back. If you have nice nails now, FlexiNail will make them better. 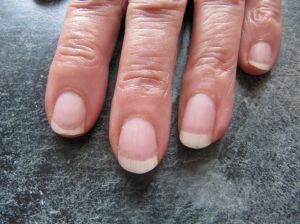 If you're taking off an artificial nail system, FlexiNail will dramatically help your natural nails. you're guaranteed gorgeous, natural nails! "I have tried numerous other nail creams oils and systems (both internet and retail) through the years and this is the first product that ever delivered what it promised." "It's the first time in my life that I have strong long lovely nails without peeling or breaking." Click on the video screen above to view a short, one minute home video we shot years ago showing the results of Derek's three month FlexiNail challenge. A hard but flexible nail doesn't chip or break when stressed! Click on the video screen to the right to view a short, one minute home video we shot years ago showing the results of Derek's three month FlexiNail challenge. A hard but flexible nail doesn't chip or break when stressed! You wouldn't be on this web site if you didn't want to improve your nails. So, chances are you've already tried all kinds of products - but you're still frustrated. We promise not to waste your time, but if you'll spend a few minutes with us now, we'll give you some great information on how to get the natural fingernails you want. If you have a minute, be sure to click on the video player screen to watch the short one minute video showing what we mean by strong AND flexible nails. This amateur video shows the result of our challenge to Derek (our customer service manager) to grow his fingernails for three months using FlexiNail. He actually hated the long nails and only kept it going on his left hand - and even then trimmed the nails twice. Part of the video shows him using his fingernail to slice through a raw carrot and then being able to bend the nail over ninety degrees. It's interesting to watch if you have a minute. How FlexiNail Works... PENETRATION IS KEY! 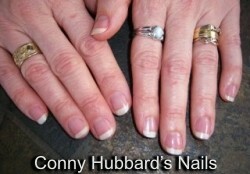 For a nail conditioner to show long term results, it needs to penetrate the nail's protective coating. Most conditioning oils don't penetrate - they just sit on top of the nail. They absorb into the cuticle - but not into the nail itself. Many products even advertise "vitamins" - but in many cases this "vitamin" or antioxidant is one of the ingredients used to simply stop the oil in the product from going rancid (and it sounds good too). For a conditioner to be effective - it has to get into the nail which is made of alpha keratin and very different in composition from the skin. Without a penetrating formulation, the ingredients can't penetrate to the nail matrix and you're wasting your time AND money. The nail matrix is critical to ongoing improved nails (the matrix is the part under the cuticle generating new nail growth). Looking after your nail matrix today, helps ensure healthy looking nails a few months down the road when this new nail growth actually grows out to the ends of your fingers. It is much easier to help out NEW nail growth from the start than it is to try to dramatically change the existing nail.. Why isn't simple nail care information more forthcoming? Because nail care is a HUGE industry (think fake nails, cuticle oils, nail hardeners, etc). FlexiNail isn't out to change the nail care industry, but our loyal customers do understand and appreciate how simple it is to IMPROVE and MAINTAIN their nails. If you enjoy getting manicures and pedicures on your natural nails, FlexiNail is recommended to keep nails healthy looking between visits. This is simply because FlexiNail was specifically developed to allow the conditioning complex to penetrate the nail's protective coating and get into the nail matrix where it can actually be effective. FlexiNail has loyal, almost fanatic customers because it works! To demonstrate that we're NOT like all the rest we offer a 100 day risk-free guarantee. from other happy FlexiNail Customers. For more information, please check out our FAQ page by clicking here. On our FAQ page you'll find answers to some of the more frequently asked questions we get from our customers. Do you have THICK, UGLY, BLACK or YELLOW TOENAILS? Are you frustrated with FLAKY, CRUMBLY or ROTTEN NAILS? 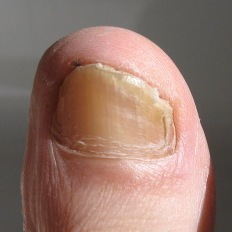 The real problem with the treatment of toenail fungus is that it is NOT on the top of the toenail - it is IN the nail. This means that treating toenail fungus with simple topical creams and lotions are ineffective because these creams don't penetrate past the toenail's protective barrier. You may have even considered expensive prescriptions or pills, but were unable to go this route due to liver or other health concerns. The result is that you still have the thick, hard, gross, rotting, discolored (grey, black or yellowed), flaking or separating symptoms of toenail fungus that you hate. You may also be on this site because you are starting to see white spots on a toe nail or several nails. This could be the start of toenail fungus so try to catch it early. Help is here and it is simple. 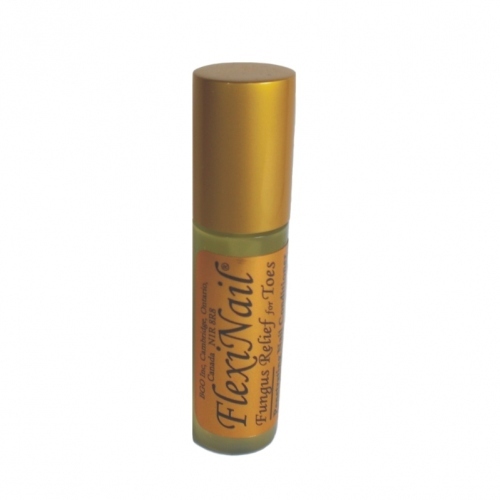 FlexiNail Fungus Relief works to penetrate the nail's protective barrier and get to the source of the nail fungus. Your toenails grow slowly, but as you treat your nails with FlexiNail it acts to control the fungus so that new growth is stronger and the toenail issues you are having will work to correct themselves over time. This is NOT a quick fix. Run away from any product that claims to have a quick fix. Stick with it though and your patience will be rewarded with much improved toenails. We are not a huge company but we take great efforts to ensure our products are of the highest quality. Your complete satisfaction with our products is our primary goal and we will promptly respond to your email questions or comments. 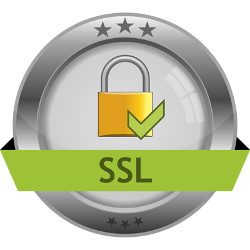 For your security, everything on our website is 100% encrypted with Secure SSL Technology. Shop Safely and with Confidence! We NEVER keep or store your credit card information after your purchase. For added convenience, choose to purchase with either your credit card or Paypal account. All Contents Copyright © 2019 Solstice Beauty. Web programming & design by Quantum Slice Corp.
All Contents Copyright © 2019 Solstice Beauty. All Rights Reserved.